“Waratah” is set well back from the road and located in the sought-after Braford Park Estate, offering you a semi-rural lifestyle only a short drive to beautiful beaches, Sawtell Village, regional airport, Bonville International Golf Club and the regional centre of Coffs Harbour. Entering the property, you immediately feel a sense of grandeur as you meander along the formal driveway through the magnificent gardens and manicured lawns to arrive at a truly substantial residence. Set on one level, the 480 m2 design offers you four internal living zones, a central kitchen/meals area which opens to a covered outdoor living area where you can enjoy the garden setting. There are five generous bedrooms with the master suite offering you a full-size bathroom, walk in robe and a dedicated dressing room. The country style hardwood kitchen features a walk-in pantry, 45mm Rose Granite benchtops, Bosch cook top in the island bench, Robinhood hammered – copper range, Bosch dishwasher and a Smeg 70 cm pyrolytic oven. To keep you cosy, the meals / family area features the most magnificent Scandia Concordo slow combustion wood heater which has been fully restored complete with a new copper flue. There is also a fully ducted air conditioning system installed for your comfort. Notable features include 120,000 litre water storage tanks, new water bore and automatic irrigation system, garden feature lighting and coach lamps for the driveway, back to base alarm system, 3.5 kw solar power system, solar hot water system, wine cellar, separate powder room and a rumpus/games room that easily accommodates a full-size snooker table. There is a double garage under roof line with direct access into the home, automatic entry gates with video intercom, remote workshop / garage with 3 phase power and room for two more cars. There is room to install a pool and tennis court if you so desire and plenty of space for boat and caravan storage. Waratah has a story to tell. It was in the early 1980’s that the Smith family of 7 decided to leave their home in Sydney to move to Coffs Harbour. At the time the family of were living in the Blue Mountains and operated a successful nursery and landscaping business in the village of Lawson. Brian & Margaret dreamed of a sea change with the opportunity to enjoy warmer weather and a more relaxed lifestyle. 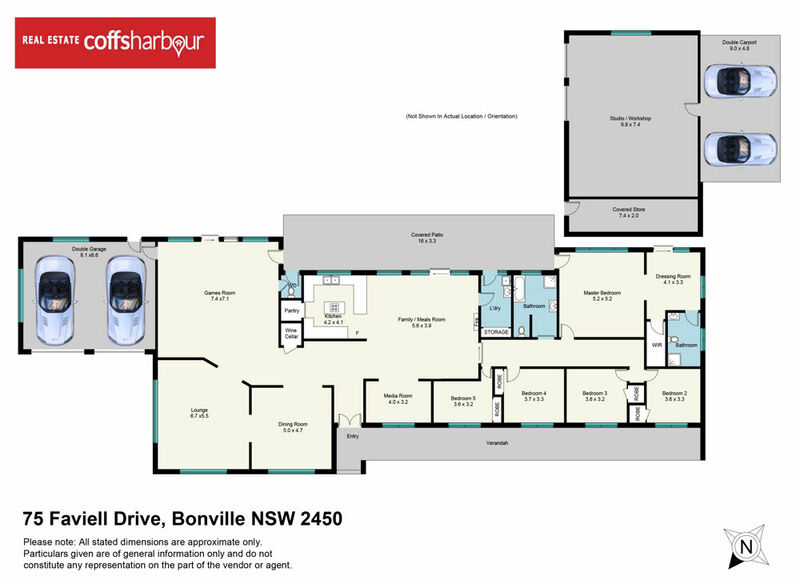 They purchased a 5-acre property in Bonville and commenced plans to build their new home. With their background in horticulture and landscaping Brian and Margaret could see the enormous potential of this land. Their vision was of a botanical garden including many exotics from around the world. A mountain vista would provide the perfect backdrop to this majestic estate. Their legacy is preserved in a most beautiful garden with mature trees, shrubs and many fruiting species. The layout incorporating formal garden beds, fruit tree orchard, vegetable garden, serpentine drive and hedges, provides many private spots to sit and reflect on a good life surrounded by natural beauty. The gardens are home and sanctuary to many native birds and amphibians.